On this day in 1975 Rossini’s L’assedio di Corinto (more or less) had its American stage premiere at the Metropolitan Opera. 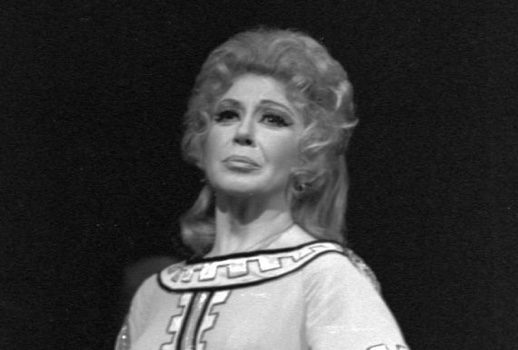 Soprano Beverly Sills made her official Met debut as Pamira. …The audience became frenetic even before she had completely materialized on stage, as if to greet a long lost daughter now returning from years abroad in foreign opera houses. In actuality Ms. Sills has been a hundred yards away at the New York City Opera for most of her singing life and this was merely the gracious conciliatory gesture from her to the Met which under a previous administration had either ignored her or offered her such silly roles as Martha. Most people in the sold-out house had bought their tickets a year ago when the event was first announced. Others had queued up all night for standing room tickets in order to hear Ms. Sills and a cast which included Justino Diaz (Mometto), Harry Theyard (Cleomene), and Shirley Verrett in the “travesti” or trouser role of Necole, Pamira’s suitor. Despite a recent recording from Angel with the same principals the opera no doubt was unknown to most present. At one point mezzo soprano Verrett found herself trying to outshout a screaming audience which thought she had finished her third act aria, when half still remained. Like most serious works by Gioacchino Rossini, the Siege has hardly been heard in the 20th Century (a rare revival at La Scala in 1969 introduced Beverly Sills to European audiences). . . . The arias are vocal extravaganzas that would terrorize all but a few singers today. A particularly demanding example is Necole’s “E d’un trono alla speranza” which requires high Cs and very difficult coloratura passages from the mezzo soprano. Shirley Verrett tore into it with commendable sang froid. I don’t recall ever hearing anything like it. Furthermore, she looked surprisingly well in male attire and instilled even her stylized movements with passion. Both Harry Theyard and Justino Diaz were also up to the technical demands of their intricate parts. Conductor Schippers’ beat was crisp and exact; his tempi were well-placed and never at odds with the singers. But what of Pamira, the reason we had presumably all gathered? She has two arias, one at the beginning of the opera and one at the end which erupts into a wonderfully absurd technical display-“Parmi vererlo.” And Miss Sills, for all who may have worried a bit, aware of her recent illness, sang it and much of the preceding music with the perfectly phrased abandon one expects from her. In the beginning her voice was not quite as pure as it usually is, but the most difficult passages were done with flourish and the top is still secure. . . . Thus the role was vocally satisfying for both soprano and audience. Dramatically it is dead. Pamira is one of opera’s less fascinating heroines. When she finally stabs herself for the usual reasons of “l’onore” and “patria,” muddled concepts that have exacted the greatest opera fatalities, nobody cares all that much. This less the fault of Miss Sills, who is appealing even when inert, but that of director Sandro Sequi’s static approach to the libretto. He has a gift for tableau-the final collection of Corinthian ladies standing in the catacombs was effective. But whenever anyone had to move, especially the chorus, it was either uninteresting or embarrassing. The final massacre was so inept, the audience laughed mercilessly. . . .